Preparing the path where there is no road…. After major flash flooding devastated many of the himalayan valleys in Uttarakhand, Amma pledged to rebuild 500 homes in the area. The first phase of that work is going on in and around the village of Chandrapuri in the district of Rudraprayag, on the way up to Kedarnath. A week from now 73 Japanese university students will spend their semester break helping construct houses and to rebuild the lives of people who were struck by this tragedy last summer. Since volunteers have been teaming up with Embracing the World and coming to India to help build homes for those in need. This year’s project is probably the most ambitious considering the effort it will take just to bring the students to the disaster area. I am here now at the site with other ashram volunteers. Others have been here for months as Amma sent people here immediately after the disaster for the initial relief work. But Vivek and I specifically came here to make all the arrangements for the Japanese students and help prepare their path to a place with no road…well that depends on what your definition of a road is. Our journey up here took several legs: Amritapuri to Cochin, Cochin to Delhi, Delhi to Dehra Dun, Dehra Dun to Rishikesh, and then finally Rishikesh to Chandrapuri. Up until Rishikesh all was smooth and easy, with uneventful flights and smooth roads. It easy to take the convenience of modern travel for granted since we have become so used to moving from one spot on the globe to another with very little effort, but when you travel somewhere remote or that has just been hit by a major disaster you feel every kilometer of the trip. Leaving Rishikesh, we took National Highway 58 heading north, following the Ganga back uphill to its source. 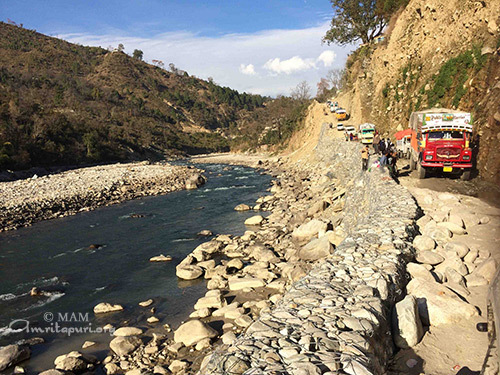 It was a glorious warm, sunny day with breathtaking views as the road mirrored the twists and turns of the Ganga, sometimes just a few meters above the beautiful emerald waters and sometimes climbing hundreds of meters high above its banks. Many parts of the drive are not for the faint of heart as there are countless blind hairpin turns that leave just a few cm of space between the steep mountain, the oncoming bus, your tires and a long way down. About two hours into the drive you get your first glimpse of the majestic snow capped Himalayas and it is hard not to be inspired by the sight of the source of all this flowing water. Soon after we reached the town of Devprayag and the Ganga heads off to the West and our road keeps following the Alakananda river north. 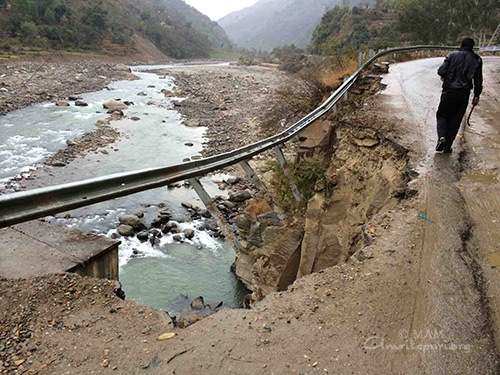 The deeper we got into the mountains, the steeper the valleys and the damage from flooding became more obvious. Since the valleys are so steep, most villages are built right alongside the river and were thus more affected by the flash floods. When we passed through Srinagar, we saw several large buildings along the riverside that looked like they had just been pushed straight down into the mud like toys by some giant hand. The buildings were still standing but submerged under several meters of dried mud leaving only the rooftops and upper floors visible. 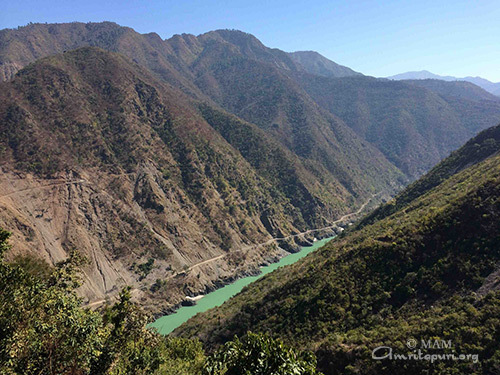 After the town of Rudraprayag the Alakananda river continues to the east but now we turn off onto National Highway 109 following the Mandakini river further north. At this point the term ‘highway’ becomes very generous; the more appropriate name would be: road, and in several places even half or a fraction of a road. In many places you can see the guard railing from the highway just hanging in space as part of the road has just vanished, consumed by the flood waters. In other places the road has completely gone and temporary one way dirt roads right alongside the river are the only way to continue. Rodeo bull riders have had smoother rides than traveling down these roads; you just have to hold on to something to keep yourself from bouncing all over the car. When we finally arrived in the evening and got out of the car it felt like we had just been tumbled around in a washing machine. The 150km leg of our trip took a bit more than 7 hours and never a dull moment. Either we were amazed at the pristine beauty of the Himalayan peaks above us and holy rivers flowing below us, utterly terrified we might soon be tumbling into one of those rivers, or saddened and in awe of the destructive force that those rivers unleashed on these communities several months ago. Despite the pathetic conditions of the roads in this region, life still goes on. The local people have no choice; no other way. There are no trains up here, no airports…just the same broken road for all the trucks, buses, jeeps, bicycles, donkeys, people walking, troops of monkeys, etc. It’s amazing to see the normal flow of traffic make their way up and down these mountains when the only way in and out is barely there. Next week, 3 buses of Japanese students will make this same journey and I am sure it will be as memorable to them as it was to us. Thank you so much for your posting – it helps us to be with you in prayer and in spirit!